Springfield Journal Register, date of paper which originally published the following is unknown. This quaint old woodcut gives an excellent idea of the Reisch Brewery at Rutledge and Herndon Streets as it looked in the Eighties - with smoke pouring from the chimneys and a general air of activity about the plant, and the horsedrawn vehicles further reflecting the period. This well-known concern dates back nearly a hundred years, one of the earliest in this field still in operation. Frank Reisch, the first, came to this country from Niederhausen in the Duchy of Baden, Germany, in 1832, and became a resident of Springfield about 1850. 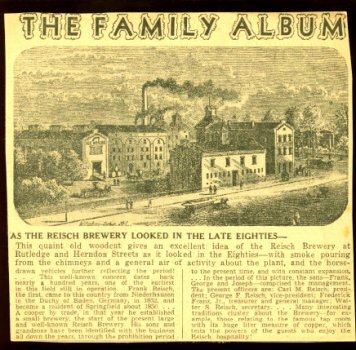 A cooper by trade, in that year he established a small brewery, the start of the present large and well-known Reisch Brewery. His sons and grandsons have been identified with the business all down the years, through the prohibition period to the present time, and with constant expansion. In the period of this picture, the sons - Frank, George and Joseph, comprised the management. The present officers are: Carl M. Reisch, president; George F. Reisch, vice-president; Frederick Frank, Jr., treasurer and general manager; Walter S. Reisch, secretary. Many interesting traditions cluster about the Brewery - for example, those relating to the famous tap room with its huge liter measure of copper, which tests the powers of the guests who enjoy the Reisch hospitality.